Job hunting is something we're all scared of. Mostly because it means a journey into the unknown, and is linked to being unemployed. Nobody likes that. However, when you take into consideration some of the facts about job hunting, you can get relieved. Unless you're one of that 18 % that hunts for a job while sitting on a toilet. In that case, you should be ashamed. Or not. Your life. Learn some great tips to find job easier, words people like to see there, and the cliches that are being frowned upon. All that can help you in landing a job that you want, and all that you can find here. 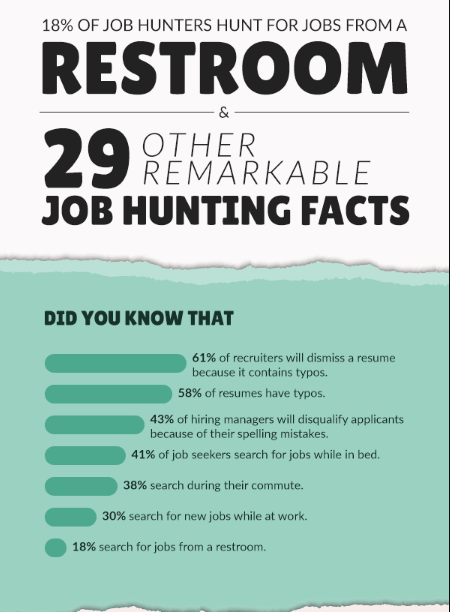 Or you can simply find that infographic resumes. They're on fire lately. It doesn't allow you to place all the information people generally don't care about that we usually write. No cliches, no place for mistakes, and on top of it all, they look awesome!